Last weekend I attended Ad Astra, and it was a blast. How big of a blast was it? Well, you'll have to head on over to Worlds of Tim to find out! I've written a thorough report, complete with three photos. Like this one here of me trying to break up a fight between Luke Skywalker and a Stormtrooper. Go check it out! After a one-year hiatus, I will be returning once more to Ad Astra, one of Toronto's science fiction and fantasy conventions. I will be on three panels, one of which I suggested to them, and I will also be doing a reading and an autograph session! I will also have a table in the dealer's room to sell and promote my books. Tonight I will take part in the panel, Choosing A Format, a discussion on the various formats of publication (novel, short story, etc) and whether or not an author knows in advance which format will work best for their latest idea. Tomorrow I will take part in an official autograph session(! ), which will be my first at a convention. 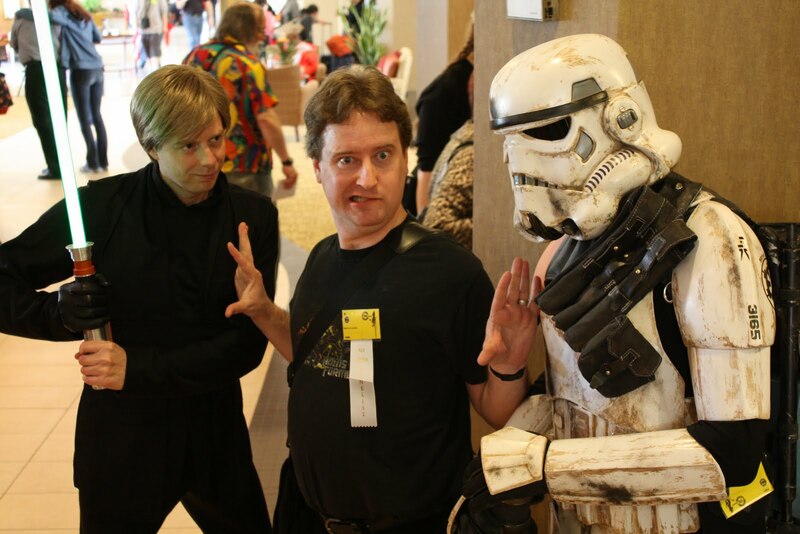 This puts me a step closer to acceptance in the eyes of the sci/fi convention community. In the evening I'll have two panels, both regarding the Doctor Who universe. The first is about who your favourite Doctor is (there are eleven of them now), and the second is about the five-part Torchwood: Children of Earth special that aired last summer. That's the one I suggested; I thought the special was brilliant, and I look forward to talking about it. On Sunday morning I will do a reading. Hopefully I'll have a nice crowd of eager book buyers in attendance. I'll post again soon, hopefully with photos, to let all of you know how it went. I'm excited, as I usually am. Conventions are a lot of fun.